particular, was submitted by Michelle Peacock of Mohave Middle School. Thanks Michelle for sharing! I thought this was a perfect lesson to do with my fifth graders. I have many posters of Matisse's artwork for inspiration, but if you don't, simply talk about how cutting paper can express movement and emotion. I gave each child a piece of white construction paper about 10 x 16. 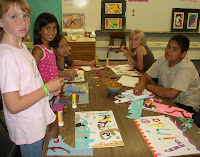 Each table had scissors and glue sticks (regular white glue is too messy for this project). At the back of my art room, I arranged scraps of paper. Note: This is a great project to do towards the end of the school year when your recycled paper box is very full. I instructed the students to cut out the letters in their name plus something that is unique to them. 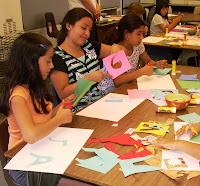 I demonstrated that by reducing a large sheet of paper to a smaller rectangle or square, letters are easy to cut out. This can be a challenging lesson, and many kids will balk at not using a pencil, but don't give in! I think being encouraged to "see" the shape and cutting it is beneficial. Of course, I stress that any shape, size or style is perfect. We discussed the benefits of cutting all letters out first, then the back ground shapes and playing with the arrangement before gluing. Some kids will rush this part then be caught having to pull up their letters. Thank you so much for your blog. As a new art teacher (who just sort of fell into this position), you have no idea how many avenues of art making you are creating for my students. Thanks for all the great ideas! Glad I can help. 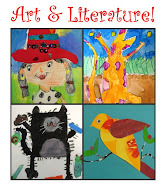 I started this blog for my student's and their parents but it has morphed into a blog mostly for art teachers. Good luck with your new job! What a great project! 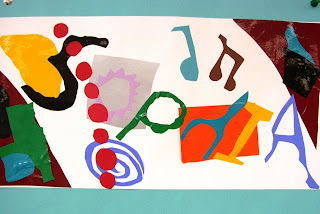 I love Matisse and I love how colorful they are! When completing this assignment with 4th and 5th grade students, I encouraged them to morph their letters into significant images. "J" become a fishing hook, "i" become a paint brush, etc. Their work was displayed with the questiion, "Who am I?" 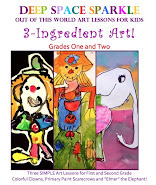 As a homeschooling mom, this site is proving to be full of great ideas. Thanks!